The costume collection includes a wide range of objects, from children’s wear, evening dress, menswear, military uniforms and wedding clothes to shoes and accessories and nnightgowns and under slips. Our earliest costume dates from 1790s and a number of different fashions are represented from the 19th century bustle to 1960s mini dresses. The textile collection contains quilts and rugs as well as equipment for lacemaking, weaving and wool working. This quilt was made at the Sunday School of St Peter and St Paul͛’s Church over a number of years under the supervision of the Reverend G. H. Lightfoot. It is worked in red and white chain stitch on a Turkey red and cream cotton calico background. 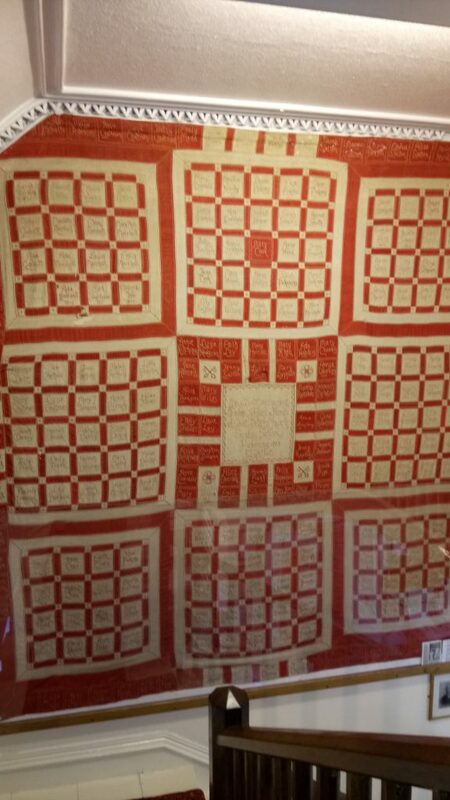 Church quilts of this type were often made as a way of fundraising for the church. The calico squares would be paid for by individuals who would then pay for names to be embroidered onto them. If a person did not have enough money to have the square done for them, they could buy a plain square and embroider it themselves. One of the names on the quilt is Annie Tomkins. She was maidservant to Reverend Lightfoot. When the Lightfoots died, Annie obtained the quilt. It was passed onto her daughter who donated it to the museum in 1988. The quilt is on display at the museum alongside another quilt made by the St Peter and Paul Sunday School one hundred years later. Turkey red is the name given to the dying process which originated in the Levant (approximately where Syria is today), and which gave a bright and fast red colour - something the textile industry had been trying to perfect for many years. It was first used in Britain in the 1780's, in Manchester, and the technique was a closely guarded secret. By the end of the nineteenth century, Turkey red cloth was widely popular and hugely profitable, despite requiring a lengthy process to achieve the colour. The raw material was dyer's madder, or Rubia tinctorum, a plant root. Bull's blood was also used in the method but it is unclear what effect, if any, this had. We have many items in the collection which have been dyed with the Turkey red process, and they are still vibrant today. The customs and rules relating to the period of mourning following death were strict and pronounced in the Victorian period especially regarding clothing. Mourning clothes could be hired from undertakers or from Friendly and Burial societies, which hired out clothing to those that were not able to afford to buy them. During the first year of mourning, 'full mourning', a woman would have worn heavy black clothes known as widow’s weeds. This black silk gown is made out of bombazine which was popular for mourning clothing as it was hard wearing and would last for the whole mourning period. Mourning periods differed depending on the relationship to the deceased. A husband or wife was mourned for two years, a child for one year, grandparents and siblings for six months and aunts and uncles were mourned for two months. The sleeves and bodice of the gown are decorated with fine cord in a style known as ‘frogging’ and a crinoline would have been worn under the dress to give the skirt fullness. Around the waste is a chatelaine, a set of short chains on a belt used to hold items such as keys, thimble or scissors. The mourning gown would have been worn along with a mourning cap for indoors or a black bonnet with a veil for outdoors. This bonnet is made of black silk with decorative lace, silk bows and ribbons.